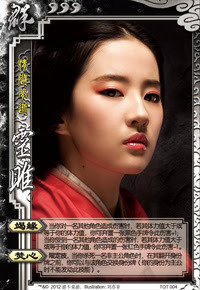 When Ling Ju is damaged by another player whose health level is no greater than that of her own, she can discard a red-suited hand card to reduce the damage by one. When Ling Ju damages any other player whose health is no lower than that of her own, she can discard a black-suited hand card to increase the damage by one. Single-Use Ability: When Ling Ju kills another character, Ling Ju can exchange role cards with the player that she just killed. Ling Ju cannot activate this ability if she is the king or the person she killed is the king. To activate "Deplete Karma" when she is damaged to reduce the damage she receives, Ling Ju must be damaged by a character whose health level is greater than or equal to her own. To activate this ability to increase the damage that she deals, the target's health level be greater than or equal to Ling Ju's health level. In both cases of "Deplete Karma," the health level of Ling Ju and the target are assessed before the damage is taken. For example, if Ling Ju has three units of health and another character with two units of health damages her, she cannot discard a red-suited hand card to reduce the damage caused by her by one, since her health level was greater than the target's health level before the damage was caused. When Ling Ju takes damage with armor equipped, "Deplete Karma" goes into effect before the armor effects are taken into consideration. For example, if a character damages Ling Ju with a Fire Attack when she has the Wood Armor equipped, Ling Ju can discard a red-suited hand card to decrease the fire damage by one before the effects of the Wood Armor are taken into effect, preventing all damage done to Ling Ju. 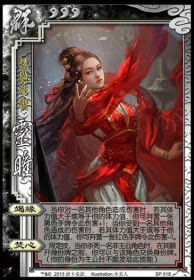 In order to activate "Deplete Karma," Ling Ju can only discard red or black-suited cards from her hand. She cannot discard equipped cards. Note that "Burning Heart" is a single-use ability. Once this ability is activated, Ling Ju can never activate it again. When "Burning Heart" is activated, the role cards are switched before the killed player's role card is revealed. For example, if Ling Ju is initially a rebel and she kills a loyalist, she becomes a loyalist and the killed player becomes a rebel. Ling Ju would then draw the three card bounty. Note that "Burning Heart" is not enforced. When she kills someone, Ling Ju does not have to switch role cards with them. Ling Ju cannot use "Burning Heart" is she is the king. She also cannot use it if she kills the king. "Deplete Karma" gives Ling Ju offensive and defensive options. It makes every card in the deck, regardless of its color or contents, useful to Ling Ju. For example. Ling Ju can use the spade Lightning to increase the damage done to another character. She can use Harvest to decrease the amount of damage done to her by another character. In many cases, these cards would not be inherently useful to the character that drew them. "Deplete Karma" allows Ling Ju to do a massive amount of damage through Chains. If Ling Ju deals damage to a chained character with more health than she has, she can activate this ability to increase the damage done to all chained characters by one. Additionally, as she damages other characters, she can continue to discard black-suited cards to deal even more damage to the other enemies. "Burning Heart" allows Ling Ju to 'jump ship' if her team is not doing well. "Deplete Karma" is a very card intensive ability. As such, Ling Ju is vulnerable to card destruction. Without hand cards, Ling Ju cannot activate the offensive or defensive components of this ability. In fact, Ling Ju often finds herself low on hand cards without the presence of card destruction characters. "Burning Heart" can be difficult to activate in such a way that it is useful to Ling Ju. If Ling Ju is motivated to switch teams, the other team is probably stronger and has more Peaches and Wines to save the dying team member. "Deplete Karma" will not be useful in accomplishing this unless Ling Ju has as much health (or less) than the character she is trying to kill. Liu Bei/Guo Jia/Xun Yu/Chen Gong - These characters can give Ling Ju cards to help her activate "Exhaust Karma." Pang Tong - Pang Tong's "Shackle" allows him to easily play Chains on the enemy characters. This can quickly magnify the damage done by Ling Ju when she activates the offensive option of "Exhaust Karma." Zhang Liao/Zhang He/Gan Ning/Liu Feng/Jiang Wei - These characters specialize in card destruction. They can rid Ling Ju of her hand cards and make it difficult to activate "Exhaust Karma." God Zhao Yun - God Zhao Yun's low maximum health level makes it difficult for Ling Ju to activate "Exhaust Karma" on him. Even if Ling Ju is low on health, "Soul of the Dragon" makes it difficult for Ling Ju to find a way to damage him. King Ling Ju is a poor king choice. In games with five or more players, her increased health limit makes it more difficult to activate "Exhaustive Edge." As the center of attention, Ling Ju will find herself low on hand cards at all times, further exacerbating the problem. Loyalist Ling Ju is a serviceable loyalist. "Exhaustive Edge" can be used to cause a lot of damage to the rebels in a short amount of time. Rebel Ling Ju is a serviceable rebel. Due to the king's increased health limit, "Exhaustive Edge" is an excellent offensive option for Ling Ju when damaging him/her. Also, if she is able to kill a loyalist, she can activate "Burning Heart" to switch teams, then draw three cards for the rebel's bounty. Spy Ling Ju is a great spy pick for the simple fact that she can switch out of this role immediately after she kills a rebel/loyalist via "Burning Heart." Ling Ju is a very interesting character. "Exhaustive Edge" is very powerful against characters with more health. It is particularly powerful when Ling Ju plays Barbarians and Hail of Arrows, as she has a high chance of causing at least one other character damage. "Burning Heart" is nice as it allows her to 'jump off of a sinking ship' so to speak if her team is losing and she is able to kill a member of a the more powerful team. It is also very nice when she is the spy. On paper, she seems like she is overpowered. This is far from the case due to the aforementioned weakness to card destruction. When using her, manage your cards very carefully.